Send in the Clowns | Arts and Culture | Style Weekly - Richmond, VA local news, arts, and events. Staunton artist Benjamin Frey looks for wonder and meaning at the circus with a new show at Glave Kocen. Maine-born artist Benjamin Frey explores circuses and carnivals of long ago in work such as “Going Places” (pictured). The artist begins his complex drawings by layering papers and pages from antique encyclopedias and school books. If, as Socrates said, philosophy begins in wonder, so can art. For mixed-media artist Benjamin Frey, a sense of curiosity and wonder leads him to create dense, fanciful images of circuses and carnivals. As he sees it, such simple subjects bring a foundation to complex 21st-century lives. 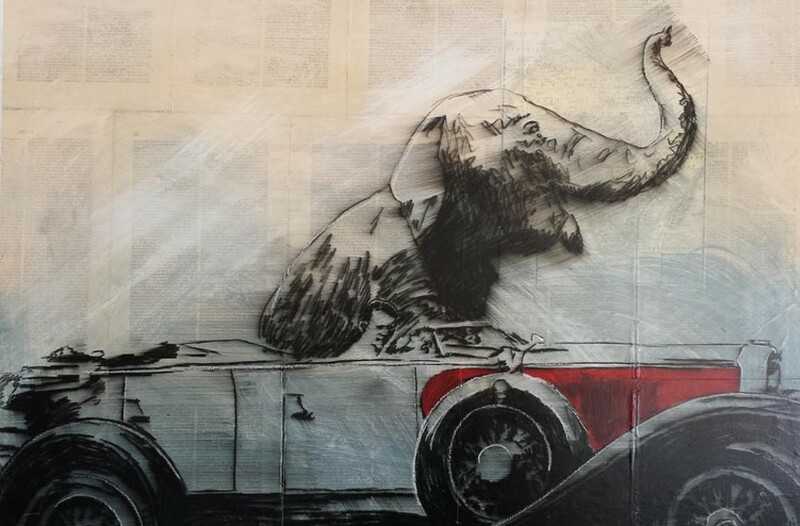 Frey's "Modern Myths and Metaphors" show at Glave Kocen Gallery sets out to engage the viewer's sense of wonder and excitement based on the artist's contention that carnivals and circuses are the last places people allow themselves to believe in monsters, giants and uncommon acts. "It's a world of archetypes and symbolism," Frey says from his home in Staunton. "They bring us back to a sense that there is much more to the world than we are accustomed to experiencing. There we witness heroes and monsters and it reminds us of the world's ability to amaze." Working with pages from antique encyclopedias and schoolbooks because he finds the typefaces interesting and the illustrations clean and bold, he collages layers of them onto the canvas. Then he works with glazes and washes of acrylic paint to build up the background textures and set a mood for the drawing, a process that requires multiple drying periods for each layer to harden. For the drawing itself, he works with lithographer's crayons and watercolor pencils, blending the watercolor pencil with acrylic medium to create mid-tones and a sense of movement. And movement abounds in Frey's work. The drawings are intricate and dynamic, conjuring up a mostly monochromatic world of Ferris wheels, elephants balanced on balls, carousels, acrobats and tightrope walkers. Intended to evoke the mood of antique photographs, the work creates a window into other times and places. Growing up in Maine as part of an artistic family, Frey was inspired by the artwork he saw his parents and grandfather creating. "It's hard to point to my first artistic experience," he says, "but I do remember feeling joy drawing at an early age." Captivated by André Malraux's idea that an artist begins not with the desire to imitate nature but with a love of art and a desire to create something like it, he's quite sure being raised in that artistic environment was a major factor in his development. Where he once thought that a work of art should communicate a definite idea clearly, he's come to believe that the strength of art lies more in ambiguity and that it can inspire different reactions. "I have begun to think of visual art as a kind of catalyst for thoughts rather than something which conveys an exact idea," he says. "And as such I hope each viewer is moved to take their own meaning from the work." He considers the most important part of being an artist as simply making art, developing his ideas in real time on the canvas. The circus and carnival series began when he picked up a lithographer's crayon and began drawing an Italian clown over one of his abstract collages, enchanted by the moody and sad effect it created. Keeping his palette almost monochromatic, he avoids the garishness of "Ronald McDonald and creepy, colorful clown" imagery, he says. Like visual metaphors, Frey's art seeks to blend memory and desire into an experience that's simultaneously personal and common, bridging the space between individual lives and the realm of shared imagination. "Benjamin Frey: Modern Myths and Metaphors" runs through May 3 at Glave Kocen Gallery, 1620 W. Main St. An artist talk is scheduled for 11:30 a.m., April 26. For information call 358-1990 or visit glavekocengallery.com.